Coal gangue crushing line consists of GZD1500×6000 vibrating feeder, PE1200×1500 jaw crusher, two sets of GZD1300×4900 vibrating feeder, two sets of HPC400 high efficiency hydraulic cone crusher, two sets of 2YZS2460 vibrating screen, two sets of 5X1145 vertical shaft impact crusher and four sets of 3YZS2160 vibrating screen. 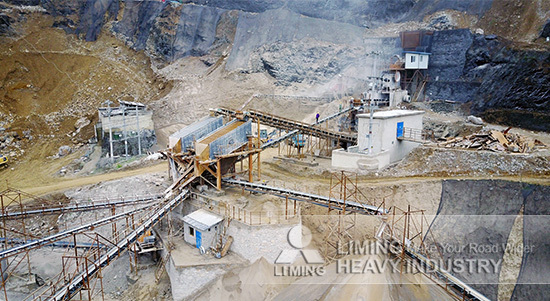 The capacity of coal gangue crushing line can reach 200-300T/H, and the finished products’ size can be 1mm. Raw coal gangue whose size is bellow 1020mm will be sent to vibrating feeder, and vibrating feeder will sent materials to jaw crusher next. Jaw crusher will crush stones coarsely, and the size will range from 150mm to 300mm. Vibrating screen will send materials to hydraulic cone crusher for secondary crushing, and then materials will be screened out by vibrating screen. The materials larger than 40mm will be sent to cone crusher, and others will be sent to vertical shaft impact crusher for shaping. Then materials will be sent to vibrating screen for screening and then will go to finished product area by belt conveyor.